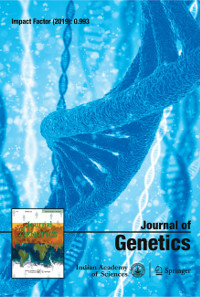 Chromosomal locations of major 45S and minor 5S ribosomal DNAs (rDNAs) and organization of 5S rRNA genes were analysed in five different populations of golden mahseers (Tor putitora) using fluorescence in situ hybridization (FISH) and Southern blot hybridization. All five populations of T. putitora ($2n = 100$) showed a similar type of macro-karyotype composed of 12 metacentric, 22 submetacentric, 14 subtelocentric and 52 telocentric chromosomes. Analysis of active nucleolar organizer regions (NORs) by silver staining did not show any differences in number and chromosomal position in different populations. But FISH data showed significant difference between the populations, four of the five populations showed six 18S (three pairs) and two 5S (one pair) signals with positional polymorphism, while one population showed eight 18S and four 5S signals, respectively. Southern blot data confirms that 5S rDNA clusters present on two different chromosome pairs in Kosi river population contain non-transcribed spacers (NTS) of same length. In the present study, simultaneous localization of 45S and 5S rDNA by in situ hybridization helped us to develop the discrete population-specific markers in different geographically isolated populations of T. putitora.